Please note that our offices will be closed August 3-August 7, 2015. If you have a housing emergency refer to our Tenant Services page HERE. Our Housing Rights Campaign work is focused on fighting gentrification. We focus on policies, direct actions, basebuilding and coalition work to fight for resident decision making regarding development and pushing the government to prioritize housing and tenants’ rights. We build the power and agency of Black and Latino working class residents in an effort to stop displacement and assert our right to stay in our homes, our neighborhoods and our city. Our housing rights campaign work has yielded a number of policy victories and advances in the fight to build tenant power and tenants’ rights in Oakland and San Francisco. 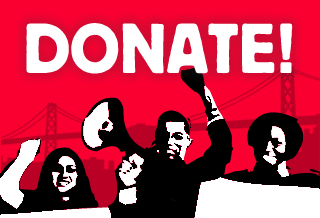 In 2014, we were at the forefront of fights to: establish a Rent Cap in Oakland; remove debt service — a provision that used to allow property owners with negative cash flow to pass on as much as 95 percent of their loan payments to tenants; and passing the Tenant Protection Ordinance – an ordinance that defines and outlaws landlord harassment and neglect. In San Francisco, we won the buyout legislation and the Ellis Act relocation ordinance, as well as pushed back the timeline for a proposed “monster” development at 16th and Mission. We’ve fought hard against the national real estate lobby in our Yes on G campaign, and although we lost at the polls, we won big as a movement. We deepened critical relationships, learned lessons about civic engagement, and provided a national example for taking on speculation and fighting back against gentrification and displacement. In 2015, the housing rights campaign will focus on building a regional movement to fight displacement. Tenants throughout the Bay Area are suffering from this housing crisis, and we will support the fights of working class tenant communities organizing to build power and pass policy throughout the Bay Area. Our top priority is the work against profit driven development. 2015 will be the year that we solidify the foundation of a regional movement to demand development without displacement and to assert that the needs of existing residents drive development in the region. In SF, we will continue our role in the Plaza 16th coalition, and keep a close eye on changes to public housing. In Oakland, we will continue with the community planning leaders program – a program specifically designed for resident engagement to stop displacement from the Bus Rapid Transit system being built along International Blvd. We will also push for the City to have a department tasked with tenants’ rights enforcement. ¡Llaves de Casa, No Esposas! ¡La lucha contra el desplazamiento continúa con triunfos recientes en ambos lados de la Bahía! ¡Victoria! ¡Los vecinos paran las ejecuciones hipotecarias! ¡Acción contra Bancos en San Francisco! ¡No aumentos de renta sin trabajos! ¡Unidos en la lucha para hacer PAGAR LOS GRANDES BANCOS!